Project Jajarkot - 22 Schools and 4,000 Students are Drinking Clean This Week. On April 2nd, our LAST MILE TEAM of self-funded travelers arrived in the Jajarkot District of Western Nepal. This far-flung region of the country sees few foreigners. In fact, the village of Jajarkot has not hosted a Western traveler in years, and some couldn’t remember if they ever had. This is a place far removed from tourists tracks, and one of the most beautiful places in Nepal. It’s also hard hit by water illness every year. Just days before our arrival, the national news included reports of hospitals overflowing with sick patients. It’s for that reason we launched Project Jajarkot. When we finally reached Jajarkot after three days of travel, our first stop was to the ancient palace atop a Himalayan foothill. Once the seat of the regional kingdom, it now serves as the office of the local government. The district governor welcomed us to his office with an envoy of officials. There he explained their need for clean water systems to help save his people from the ravages of waterborne disease. Our goal for the trip, one we had been planning for months, included a water health event hosted by the village of Koina Bizaar. More than 25 school administrators and teachers traveled to Koina, some walking for days to get there, to receive their very own MSR SE200 water treatment system. As is often the case, the community as a whole spoiled us with dances, songs, and more hospitality than we deserved. But such cultural exchanges are what make our water efforts so special. As we left Koina, we made plans to return with another group of travelers in just two weeks time. Our crew of Nepalese facilitators will fill the time in between ensuring all 22 systems we left behind are well implemented in local schools and villages. We will return again on May 4th with more water units. The objective for the spring is to get 50 MSR SE200 Community Water systems installed in the district. And we’re well on our way to meeting that goal, thanks to all of you, our loyal supporters. 5,000 Students in Surkhet are Drinking Clean! We don’t often bite off more than we can chew, but our most recent project might have been overly ambitious. In January we met with the Headmaster of the school district in Birenbandagar, the capital of the Surkhet district and Karnali Province. We didn’t know it then, but getting water to those 500 kits would lead to our next few weeks of work and reaching an additional 5,000 students! The best part was the warm welcome we received by the students, faculty, and regional government officials who stated their appreciation for our involvement and investment in their youth. But that’s not all. Our work gained the attention of other school systems in the area. We now have a waiting list of more than 13,000 students hoping to get access to safe drinking water. We’re ambitious, but we’re also aware of our operational limitations. We can only serve these students if we have the resources to do so. Our efforts to seek additional funding and donations are underway. One thing is certain, our work has only just begun. Now the race is on to gather more donations to support our ground teams in Nepal. And in more exciting news, our next three team of self-funded travelers are on the way to Nepal in just 30 days! Don’t forget to donate to the CLEAN DRINK FUND. Together we can get water to these next 13,000 kids! When we first arrived in the small refugee camp of Pardule in April of last year, they were not too impressed to see us. Other organizations offered help but never delivered on the promise. As we said we would, we returned in the middle of monsoons to deliver an SE200 Chlorine Maker and a 500-liter tank. In the time since, we have revisited the village twice to make everything is working as needed. The leader of the community now greets us with a big smile like we’re old pals. Trust. It has to be earned in Nepal, and that’s fine by us. The large NGOs said they would help the people of Pardule and never did. They now trust that we will be there if they need us. In large part because we’re not just a bunch of foreigners in expensive trucks with head offices in London and New York. We’re small. That makes us flexible, and most of all, we care. Here’s to the people of Pardule, drinking clean. Life is hard in Nepal. The government has few resources and corruption is rife. It makes doing a good deed challenging. In recent years, localized governments within newly formed provinces, like Karnali, have started to better manage their communities. This week, officials with the local government invited a group of leaders, business people, and citizens to celebrate positive changes in the community. We’re thrilled to learn Vishu Sijali, our co-founder and operations director, was one of the honored guests. Recognized for his work to promote water health, he is finally getting the credit he deserves. At CLEAN DRINK, our primary role is to empower the people of Nepal so they can help themselves. We’re proud of the work we do, and happy to see Vishu rally his peers for the greater good. The city of Birandranegar is not small. Home to 45,000 people it’s a busy place. There the Nepalese government operates 12 public schools, most of them tasked with educating 400 or more kids. We visited one of those schools in January only to learn their filtration systems were broken, and had been for years. And the water tanks they once used for drinking water were cracked and useless. We believe the best way to help Nepal beat the challenge of fouled drinking water is to leverage the youth to understand its importance. Our team immediately placed one MSR SE200 Chlorine Maker in a school and a few days later returned with a brand new water tank. We’re on our way to placing chlorine makers and water tanks in the 11 other schools. When all done, we will have brought safe water to 3,000 students and faculty. It’s easy to under estimate how much time and energy it takes to deliver clean drinking water solutions in a rugged country like Nepal. Vishu Sijali is tireless in his efforts to get safe water where needed, but even he needs help. Mitra Tamang is the latest team member helping Vishu deliver a CLEAN DRINK. We’re lucky to have him. Like all Nepali people, his selfless work ethic ensures he won’t stop until the job is done. As we raise our funds, this is where they go. They go to provide Mitra the tools needed to deliver our lifesaving water systems. Welcome to the team, Mitra. We’re lucky to have you. The people of Nepal are lucky to have you. Please continue to spread the word and push our donation drives forward so Mitra and Vishu can continue to work hard for their fellow countrymen. On the outskirts of Birandranegar sits a small facility, home to 45 senior citizens. Much like the young orphans so common to Nepal, the people at the other end of the age spectrum often find themselves alone in the world with little chance of survival. There are not many group living facilities available to this demographic and those that exist are often basic at best. When we visited this happy home, we were greeted with smiles, laughter, and dozens of shuffling feet as they followed us around eager to chat and tell us about their exciting lives. The director of the complex had other things on his mind like the poor state of their water system and their need to purchase bottled water at a premium price. Money don’t have to spend. After a few hours getting them acquainted with the MSR SE200, they were drinking safe, clean water. For many NGOs, it’s not worth their time or money to invest in 45 elders. We have a different opinion. No community is too young, old, or small to receive the basic fundamental of life, safe drinking water. May we all live such long and happy lives. It’s an underused cliche but, the future belongs to our children. And the youth of a small village in the lowlands of Nepal are taking control of their health and encouraging others to do the same. Our co-founder and director of operations, Vishu Sijali, has a soft spot for kids, particularly the kids of Gabar. He also recognized a need to offer the community a means of keeping their sons and daughters focused and driven towards a better life. What started out as a soccer club called the Cat’s Pajamas has evolved into a powerful youth group. Every week they meet to learn all the things young kids need to know to become good adults. Vishu teaches them about responsibility, respect of community and self, and maybe most importantly, how to dream big. When CLEAN DRINK needed recruits to help us spread our clean water message, Vishu knew the Cat’s Pajamas were up to the task. Now each of them can fully demonstrate the operation of an SE200 Chlorine Maker and explain why its so important to the health of the community. In the months to come, Vishu and his kids will blanket the area around Gabar to distribute as many as 50 water systems. They stand to reach as 10,000 people and offer them clean water solutions. All thanks to a group of happy kids. This is another great example of where our funds go. Whereas other organizations invest in fancy offices, shiny trucks to access places remote, or splashy ad campaigns, we spend our funds on medicine for ear infections, books for kids, and the tools needed to avoid deadly waterborne illness. We offer a holistic level of support. But we need your help. On our October trip through the terraced mountains of Nepal, our group somehow got split at a faint intersection. Half of us climbed a tiny dirt road as the other forged ahead on an even smaller track. Long after the sun had forsaken the day, we finally reunited in a quaint village perched atop a forested hilltop. Arriving late in the evening our headlights and engines caused quite a stir. When the locals saw a gaggle of foreingers standing in their village square, it made an even bigger ruckus. As is so often the case, we didn’t have time to shed our dirty motorcycle gear before shaking hands and drinking tea with the locals. As is always the case in Nepal, they did everything they could to make us feel warm and welcome. Guest is God in Nepal and most certainly in remote communities where visitors are always the most interesting show in town. Vishu and the team explain how the SE200 unit works. Within minutes our new friends were using it themselves. After an extended welcome they escorted us to a courtyard where we pitched our tents and settled in for the night. A group of teens quickly assembled to entertain us with traditional music mixed with a few Nepali pop songs. Our impromptu stop spawned a spontaneous yard party, and we were not entirely sure it wouldn’t go on until dawn. Slowly one-by-one our crew retreated to our nylon rooms, our eyes slamming shut with fatigue. The next morning we asked our hosts about their local water supply, if anyone gets sick, and our usual questions. Vishu inquired if they would like to learn about our water treatment system and before we knew it they had gathered to hear our presentation. We’re always amazed by how receptive people are to learn about our travels and why we end up in such remote places. When we explain our water initiative, the responses are always positive and engaging. 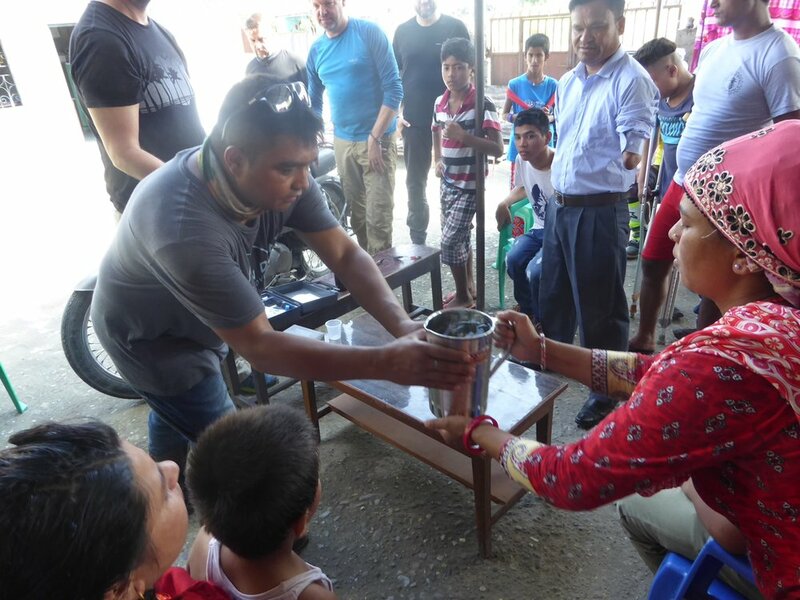 On this day, several people in the community immediately dove into our demonstration and quickly understood how the MSR SE200 Community Chlorine Maker could benefit their entire village. Packing up our tents, the women of the community thanked us for coming, sharing in a night of good fun, and for the gift of the MSR SE200 Community Chlorine Maker. And that’s how it always should be. It’s not uncommon for some organizations to enter a village and foist their aid on unsuspecting locals. We offered the water system to the villagers and they eagerly accepted. They gained a useful tool and we received a wonderful night of hospitality we won’t soon forget. We will be back to Syangja to see how they like their new system and to ensure they are not having any issues with its use. We want to offer them further assistance if necessary, but then again, we’re really looking forward to just another night of fun. Share - A night of fun and a gift of clean water. Our most valued team member is our Nepal-based Director of Operations, Vishu Sijali. We rely on his firsthand knowledge of the remote areas we visit and his dedication to helping his fellow citizens is unmatched. He sees our water initiatives as just one critical component in a wholistic approach to improving people’s lives. He sees the big picture. One of Vishu’s favorite projects is promoting Butwal as a center for tourism. His adopted home, he supports a wide range of businesses and entrepreneurs in the city. But it’s not just about business. Set far off the main road on the edge of town sits a small facility made of concrete bricks and rusted tin. From the outside it doesn’t look like much. Once inside it is a place of happy faces, laughter, and smiles. The Kalika Nagar home in Butwal is home to 35 men, women, and children, most of whom have disabilities or no family. Vishu knows this place well and having visited it many times before, knew they had an immediate need for a clean water system. After giving them a demonstration of the MSR SE200 unit, they quickly started discussing ways to get it implemented. We drafted a plan to fit their kitchen with a clean water tank, and talked about ways they can also use chlorine to quell the spread of illness within their tight living quarters. In our remaining time with the residents of the Kalika Nagar Home, we enjoyed getting to know each other. A place that receives few visitors, we were a welcome break from their normal routine. We played with the bright faced kids, chatted with the adults about improvements they hope to make, and as we’ve come to expect, they treated us like honored guests. Before we departed they gave us each a gift of freshly made sweets. It’s hard to believe people with so little to give can offer so much as a box of pastries, but such kindness and generosity is commonplace in Nepal. We came hoping to offer a useful tool and in returned received more than we could ever repay. Kindness is a rare commodity in our world, but the easiest gift to give. The residents of the Kalika Nagar Home have been dealt a tough situation, but they remain resilient, positive, and loving. We could all learn more from such shining examples of the human spirit. One of CLEAN DRINK’s inherent challenges is finding communities capable of helping us promote safe drinking water. Many rural villages don’t fully understand the scope of waterborne illnesses or how their seemingly safe water is making them sick. In the southern portion of Nepal, a growing number of villages are making strides to improve their lives through commerce. In doing so they are benefiting the region at large. The Pipra Homestay Community on the edge of Chitwan National Park is one shining example. Homestays are fast becoming an essential means of revenue for rural families and communities. A homestay is exactly what it sounds like. In most cases they’re little more than a spare room offered to passersby. In some instances, as in Pipra, the homestays are like small hotel rooms tucked into local homes throughout the village. They’re clean, comfortable, and surprisingly well appointed with fans, electricity, showers, and the all too rare seated toilet. In a country where things get a little rugged, the Pipra rooms are decidedly comfy. During our recent trip, our team landed in Pipra during the first days of Dashain. The fifteen day holiday consumes the whole of Nepal with two weeks of festivals, family gatherings, and much needed days of rest. For our team, it provided an amazing opportunity to soak up the local customs and culture of the Terai region. On arrival we were treated by a welcoming envoy of local women in traditional Tharu cultural dress. Later in the evening the community gathered at their town center for a night of dancing, music, and shared fun. After speaking with the local leaders it was apparent Pipra is thriving. The recipients of funds from other organizations and NGOs, they have become a shining example of how innovation and entrepreneurship can benefit an entire community of 400 people. Now they have the resources necessary to reach out to the surrounding areas to assist other villages. In that regard, they are ideal partners for the implantation of clean water initiatives. Aside from now being able to offer their visitors safe water, they can explain those benefits to their neighboring communities. On the morning of our departure we met with the leaders of Pipra and discussed how to best use their village as the flashpoint to get other water units distributed nearby. The first of three units we left with them went to their school. The two others are to be used in their community center and to treat water for their developing network of homestay households. It will take time for Pipra to fully adopt the system for maximum benefit throughout their 400 person village, but they’ll get there in time. And other villages nearby will follow suit. When we return we will ensure those communities get MSR SE200 units of their own. During our campaign in April, we arrived at the village of Pardule in the Surket district of Nepal with just one last MSR SE200 machine. Unfortunately, earlier in the trip we managed to damage the $1 fuse in the unit so it was not opperational. We vowed to return, although the people of Pardule probably didn't believe we would. Sereral INGOs had said the same. This week, after pushing through the monsoons, our lead field operations manager, Vishu Sijali, finally made it to Pardule with a functioning water purifier and the funds to purchase a new water tank. We're happy to report, the people of Pardule are now drinking clean water. In this part of Nepal, waterborne illnesses are responsible for the deaths of thousands of people, mostly young kids. For the people of Pardule, their chance of avoiding such illnesses has been greatly reduced. Share. Give. Go. You shared. You gave. We went. It takes a lot of good people to do the things we do. Luckily for us our community continues to grow. And with it, so too does our positive impact. This week we get to share more good news. 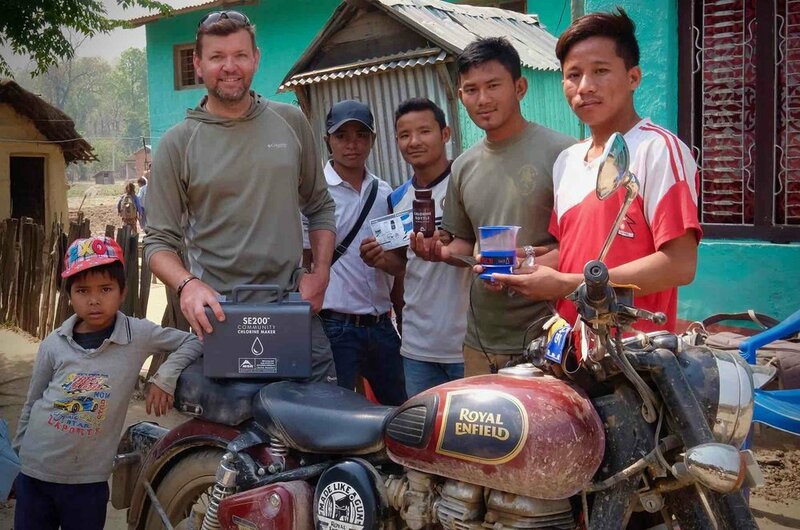 During our CLEAN DRINK trip in April, we left two MSR SE200 Community Chlorine makers with our friends at Portal Bikes in Kathmandu. Founded by Colorado natives Emily and Caleb Spear, Portal Bikes creates transportation and shelter solutions for the people of Nepal. Their staff comes from all over the country and their knowledge of rural communities and remote schools has proven an indispensible asset for the CLEAN DRINK project. 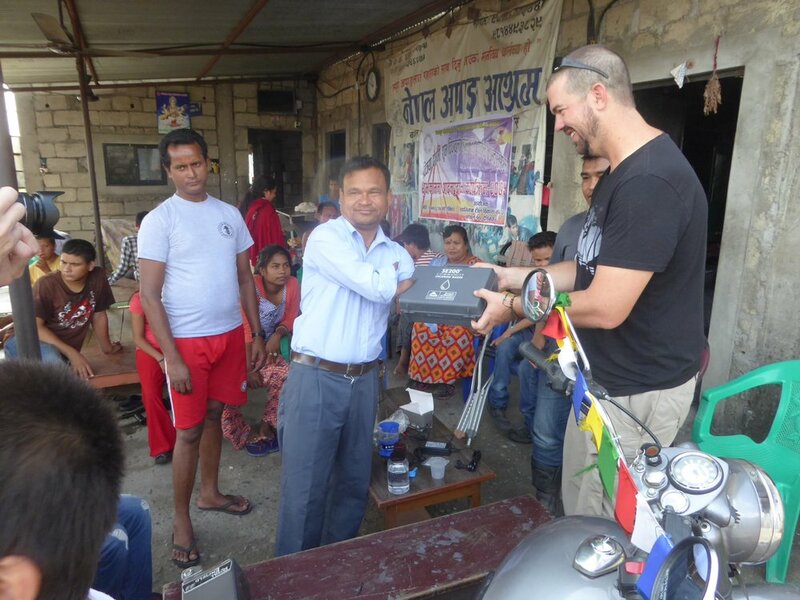 Last week, Portal Bike's Tenjing Gurung traveled to a remote school with an MSR SE200 unit. He used it as the star attraction in a small health fair where teachers and volunteers spoke to the students about clean water, dental hygiene, and other important health-related topics. By the end of the day, thanks to Tenjing's efforts, the Shree Jung school and the surrounding community now have access to safe, clean water. As we push this project forward, with your help, schools will continue to play an important role. We believe in the power of kids. Schools in themselves are proof that communities are making positive efforts to better the lives of their youth. Schools are also social centers where the MSR SE200 can be leveraged to supply safe water and chlorine for an entire community. In the future we hope to use schools as launch pads to get more MSR SE200 units into the surrounding areas. The people of Kumu Gabar are superb hosts. While visiting their small community on the edge of the Bardia Tiger preserve, they went so far as to catch fresh fish from a local river for our midday lunch. Everything they do is for the betterment of their community and those who come to visit. Helping them with their water issues wasn't a gift, but a trade. They gave us hospitality, we gave them the tools to empower themselves with clean water. There are more than 300 people in the extended community of Gabar and now they're drinking clean water and helping to tell other villagers in the area how important it is to treat their water. We have plans to return to Gabar very soon. Other villages nearby want help. And we're going to give it to them. And maybe get a fresh lunch in the exchange. Share our positive stories with your own tribe. Give to the CLEAN DRINK project to ensure we get to the schools and communities in need. Go on one of our LAST MILE trips and hand deliver clean water solutions, just as Tenjing did. Please Donate to the Clean Drink Campaign - We can do this!